ON my return to Hong Kong I found business conditions there were gradually but visibly becoming worse. Although the recent general strike and the incidental killing and maiming by British soldiers of a few Chinese was supposed to have been forgotten, the Cantonese discriminated against British goods and shipping to such an extent that many firms were ruined. There was such a rapid falling-off in my own turnover that I decided to visit all the treaty ports in quest of trade. At the end of the trip north I found myself again in Shanghai, but my old Chinese friend, the one who had shown me such kindness because I had been civil to his son, had lost the greater part of his fortune. Yet although he was on the wrong side of sixty, he spoke to me quite confidently of rebuilding it. The Chinaman is not easily downed-any more than is a Son of the Captivity! For the first time I visited the pearl market in that city, but purchased nothing. Being still interested in jade, I came to see some exquisite strings of beads, also cups and figurines carved out of that material. I had never known that such perfect things of their kind existed. Unfortunately their owners knew their value as well as I did. Though more than a year had passed since the great earthquake which wrought such havoc in Tokyo and Yokohama, the evidences of the great disaster were still to be seen on every side. In Yokohama, the fine hotel where I used to stay when I first visited Japan was now a rubbish heap under which, some said, there were still buried a number of the victims; trolley lines were for miles twisted and coiled like huge snakes; and while some thoroughfares were assuming something like their former aspect, the greater number were impassable after sunset because of the many water-filled pits and the mounds thrown up by the earth's violent tremors and convulsions. The best they could do for a European traveler was to give him a small tent and feed him in a rough-and-ready way in a hastily-constructed bungalow of flimsy weatherboard. They gave this place, a haphazard collection of shacks and tents, the name of the Tent Hotel. It came into being thus: when the disaster occurred, several Europeans, mostly young men, made heroic efforts to save those who were buried under the ruins; they cared for the wounded and maimed and consoled the stricken, although they themselves had in each case lost someone dear to them, as well as all their belongings. When the American Red Cross had done all it could do and the time came for it to leave, it made a gift of its tents and most of the paraphernalia therein to these young Europeans. They started the Tent Hotel, and when I came to be a guest there, I sat in the seat which H.R.H. the Prince of Wales had occupied at a banquet some weeks before during his tour of the Far East. One of the proprietors told me what he had seen of the first quake. A big Canadian Pacific liner was on the point of leaving Yokohama, had actually got some distance away from her berth; and my informant, together with a large crowd of people, was standing waving to departing friends, when suddenly the earth began to heave most violently. As he gazed along the water-front, the sea-wall curled like a great reptile and crumbled landwards, the earth rising in great billows of dust. He realized instantly what had occurred, and his first thought was for his wife, whom he had left only half an hour before. He rushed back through the already transfigured city, being guided mainly by such landmarks as still remained standing. He reached his own house. The front of it had fallen in, and there, under a huge beam and a mound of fallen masonry, lay his wife, half in and half out of the debris. He made frantic efforts to save her, for she was still living and recognized him, but it was all in vain, and she died in his arms. In Kioto—in the ancient city afore times called Miako, the "Residence," because the Mikados chose to hold their courts there—I had a most peculiar experience. At the time of my last visit to the town, during this particular trip of mine through Japan, three brothers kept a quaint little curio shop in an unpaved lane just off the main road. I discovered the shop for myself on one of my random strolls in quest of the interesting and uncommon. And what really induced me, on that fateful, cold November afternoon, to enter the place was a highly glazed three-handled china jug, the shade of green malachite. Its shape and design seemed unique to me, for I had not seen the like in all my travels. It occupied the center, as it were the place of honor, in a window which was ludicrously crammed with small bronzes, ivories and lacquered oddments. When I entered the shop, the three proprietors remained seated on cushions upon the raised platform behind the four-foot railing which separated it from the shop proper. They were undersized, misshapen old men with hard wizened faces, whose combined ages I guessed to be 210. They took no notice whatsoever of my entrance, but seemed entirely absorbed in warming their chilled and shaking hands over a niggardly fire of glowing charcoal in a bowl-brazier, which was small enough to have formed part of the furnishings of a Japanese doll's house. I stood for a few moments undecided whether to stay or beat a hasty retreat, for the three blear-eyed decrepit manikins cared evidently not a fig for customers, and were more like three weird dwarfs from some fairy tale than shopkeepers. However, they presented such a woeful picture of decrepitude that I really now felt that they were entitled to an apology from me for having entered their shop, bringing with me the sharp edge of the wintry blast. But out of only three Japanese words—the whole of my vocabulary—I could frame no adequate apology, and so I just stayed standing there, hoping that sooner or later someone would deign to take notice of me. The curio-laden tiers of shelves lining the whole of one wall occupied my eyes for quite some time, but they contained only the sort of things which appeal to the general run of foreign tourists. I turned to the small tables which took up most of the floor space. 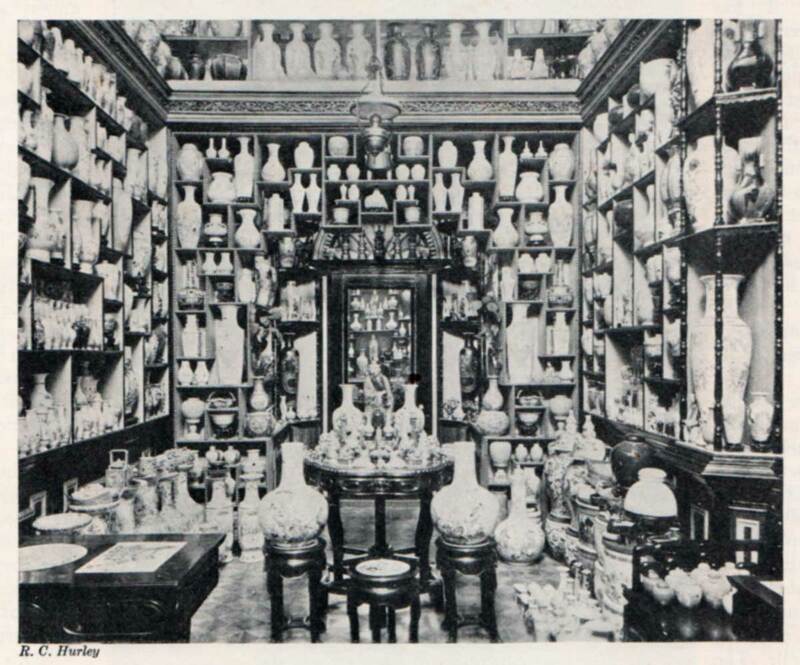 Here the wares were not of the spurious type of antiques. They bore, as far as I could judge, the imprint of great age and much usage; and quite clearly they had been broidered, carven, graven, lacquered or spun by cunning fingers long since crumbled into dust. "You see any kind you like?" he asked in an unpleasant, high-pitched voice, as with a sweep of his right kimono sleeve he pointed towards the cumbered shelves. "I like every kind I see there," I answered, "but nothing I care to buy." "I know," he said with direct abruptness, "you come to buy the jug in the window—so?" "I saw and admired," I admitted, "but I haven't the money to buy everything I like." "Sorry for you," he said with indrawn breath of politeness, and added with a self-satisfied grin which made me wince "You could not buy even if you wanted. We do not sell, no: not at any price, not the jug." He turned for confirmation to his partners, who were sitting as still as the bronze Buddhas on their shelves. Now with one accord they both shook their heads to bear him out, and then relapsed once more into their frozen torpor. Curio shop in Canton, China. From Asia Magazine, Vol. 24, No. 11, November 1924, p. 851. Click on the image for a larger version. '''Ah!'' said I, my casual interest in the jug now being fanned into the desire to own it, "I've seen no curio dealer yet who would not sell at a price. This jug has a history, then? Is it old ? Very old?" "Ver' old," repeated the dealer gravely. "When my gran'father- gran'father-gran'father was a small boy this jug was more than one thousand year old." "Well," I said, "it looks every bit as ancient as you say. What period does it belong to? Can you tell me something about it?" "Talk?" he replied, "I can make much talk of it, but you cannot stop here one month to hear me! Half of Japan history belong to this jug—so?" "I see," I said; "now I can understand why you won't sell. But maybe I could have a good look at it? Would you mind?" "You can see in the window," he said gruffly; "we cannot bring it out for any man. Maybe something happen to it, maybe bad luck, maybe we three brothers die." "No, no," I said, "nothing can happen, nothing will happen. Will you not let me see it properly?" I pleaded. Again he turned to his partners. But they only shook their heads in denial. Then he spoke to them in Japanese. Instead of an articulate reply, they shrugged their shoulders, conveying the impression that they for their part declined to assume any responsibility for what might happen. Whether out of courtesy to a foreigner or because of a desire to show off—or for some other reason—he now threw open the window and almost reverently brought out the jug and placed it with extreme care in the center of a small table so that I might view it from every angle. As I have said, the shop was absurdly crowded with small tables, and there was not much space in which to move about freely. Still I was quite sure that what happened next was not due to any carelessness of mine. As I was stooping to enable me to copy into my notebook for future reference the cryptic symbols on the base of the jug, the table tilted, the jug slid down its inclined surface, and, before I could save it, it rolled over the edge and crashed to the floor. I dared scarcely look. When I did I saw what a moment before had been a feast to any but the most indifferent eyes —scattered on the floor; a score or so of jagged fragments large and small fit only for the dustbin. Instantly and as though hoisted by a crane, the two somnolent old fellows on the other side of the rail rose from their cushions with every sign of distress on their distorted features. I stood numb and speechless. I had played the bull in the chinashop. How could I right the wrong I had done? What had been the value of this thing? What would it cost me? Would I, as a stranger in this city, friendless and alone, have much bother with the authorities? These were some of the thoughts uppermost in my mind. However, as soon as the first shock of the crash had dissolved, I began fervently to apologize. I expressed my deep sorrow for the mishap—but what are words? They alone could not compensate the old fellows. So I brought out my pocketbook and shamefacedy laid five 100-yen notes on the edge of the same table, which by now had been set up again. When the old men saw me put down the money they moaned and tore at their hair. The pocketbook was still in my hands. I added another five 100-yen notes to the others, turned on my heel, rushed out through the door and was heartily glad when I found myself again one of a large crowd on the main road. Some two weeks later I was in Osaka, the largest manufacturing town in Japan. At the hotel I made the acquaintance of an American who was the buying agent in the Far East for a Middle-West firm of world-wide repute. We spent several evenings together. He was delightful company. Of course we talked shop most of the time, but he was a reading man too, like myself, so we also discussed books. And when I found him also to be a collector of rare china I told him of my Kioto experience. He listened with great interest until I had come to the end of my story. Then he took a long pull out of his glass, snipped the end off a large cigar with great deliberation, lit it thoughtfully, stuck it into the corner of his mouth, and said, after his first few puffs, "You poor, poor simp!" "What do you mean?" I said indignantly. "Surely I couldn't do less than pay for my clumsiness?" "Wal, perhaps I shouldn't have called you that. If it's any satisfaction to you I can tell you that I got stung by those crooks in just the same way!" "Must be quite five years ago now. I also parted with a good-sized wad of United States dollars to them. Every time I think of it I could kick myself. However, since then I've met quite a few fellows who've been stung by these birds of prey, both English and American. I got kinder intrigued, you bet! So I had to find out all about these respectable shopkeepers. Say, what do you think?" But I was still speechless. "They were actors. And they had certainly learned to make up, believe me. Would you believe it that not one of them can be more than forty—and five years ago they looked close on eighty! I found out more. The table which they use is a stage prop. It's so placed that when any of the partners who remain seated pulls a hidden lever, the part of the floor upon which two of the table-legs stand gives way—an arrangement of springs. Of course the table tilts beautifully, and anything that happens to be on it must fall off. Simple, eh? But how neat! "The jug? Priceless? Why, yes, the original genuine jugs of that kind are worth a mint 0' money, but there are only three of 'em in existence. One is in the Imperial Museum at Tokyo, another's in the private collection of the Emperor of Japan, and the third used to be in the Summer Palace at Peking before the German Emperor sent his friend Waldersee to China for some curios. But the jug you paid for wasn't one, and the jug I paid for wasn't one, and the jug each of the other china-smashers paid for wasn't one! What you and I and all the others got landed with were good but cheap imitations made in Canton, South China." "Look here," I said with some heat, "it makes a good story, but I don't think it's right to take away people's characters, even by way of a joke." "Peeved, my boy?" he grinned. "Wal, I guessed I 'd touch a raw spot all right, all right. It hurts your vanity, doesn't it? But let me finish. These jugs I've said are being made in Canton, and you can buy 'em for seven dollars and a half Mex. apiece, retail; and for forty-two dollars Mex. per dozen wholesale, less five per cent. 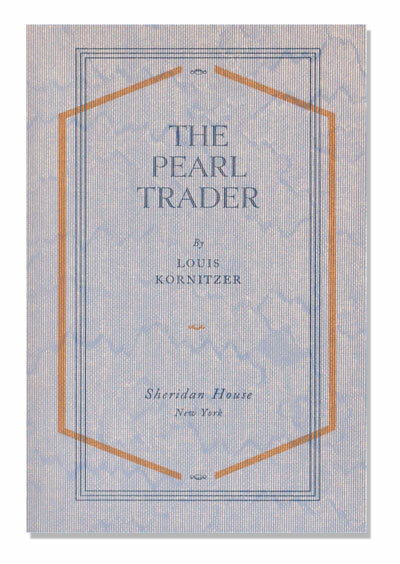 for cash with order—packed—boxed— delivered free to rail or steamer." "Is that really so?" I asked earnestly. "Wal," he answered, "some people are difficult to convince. However, when you get back to Hong Kong look me up at the hotel. We'll spend a week-end at Canton together and you shall see where they make your thousand-year-old jugs. . . ."